The biggest problem about this is that the flash appears in only one camera while both were pointing in that direction. That's a good argument for a cosmic ray. However, I would think that cosmic rays are removed during processing. My other observation is that TWO flashes were recorded one day apart from one another and while looking in the same direction. Again, only one camera saw a flash the other didn't. I've looked at a lot of mars images over the years and I don't recall ever seeing a "cosmic ray" or a "glint" in any of the pictures I've ever looked at. The NASA press release said that these flashes are seen "all the time" (I paraphrase). It's all very mysterious and I wish very much that would have at least stopped and turned around to get a better look. Live up to the rover name. CosmicLettuce wrote: The biggest problem about this is that the flash appears in only one camera while both were pointing in that direction. That's a good argument for a cosmic ray. However, I would think that cosmic rays are removed during processing. My other observation is that TWO flashes were recorded one day apart from one another and while looking in the same direction. Again, only one camera saw a flash the other didn't. The image analyst say they get similar anomalies in 1% of the images. I bet they have a filtering technique for cosmic rays, but it's probably not perfect and hence they may get flashes like these. The weird thing to me is that they actually bothered to report about it before checking it with the rover and with this creating unnecessary drama about the origin of the flash. In contrast to all other fresh crater on Mars I have seen before and which for sure have been caused by impacts as could be easily seen, this one is different as the ejecta directly attached to the impact hole is missing and it seems to be too flat for an impact crater. Report is somewhat confusing in that it shows the far shot of the terrain with a black spot on it, indicating a charred, burnt, ejecta field. Then the closup images of the crater(s) show no such features. It's devoid of debris and black soot. It's unfortunate that the images that are popularly available are of such poor quality. The HiRise site has much larger images that reveal a rounded ejection mound on the leading edge of the crater, along with downstream gouges from the material that was thrown out. The object impacted into the side of a ridge, gouging out a sloping crater indicating the direction of the meteor's travel. It's best to look at the anaglyph images in order to get a better view of the terrain. The area of impact appears to be extensively sculpted by electric arcs. However, those arcs haven't been active on Mars for millennia. A rock hit the surface. The JP2 images are the best for examining the terrain. Again, if you have the ability to view anaglyphs, they're the only way to get good information about the region. JP2 anaglyphs are over 600 megabytes in size. I'm sorry, I should have written "trailing edge of the crater". Hi all, wasn't sure where to pose this question so I found this thread about Mars anomalies and thought it would fit in. This website has some Mars Curiosity Rover pictures. Although these pictures are apparently all over the web. Uh...what's with the Mars Curiosity "Selfie" picture?? If you look at it, it's obviously taken by someone other than the rover. AgentP wrote: Uh...what's with the Mars Curiosity "Selfie" picture?? If you look at it, it's obviously taken by someone other than the rover. "Obvious" is an assumption. The jagged edges of the image suggest that it is a mosaic of many photos. What is not so obvious, except maybe to someone who has worked with panoramic imaging, is that mosaicked photos can eliminate the support tripod and other expected features from an image. Take a look at any of the Google Street View images. The view downward should show the mapping car that took the shot, but it does not. This is an extremely crude example of the blurring and stitching used in panoramic images, but it gets the idea across. Kolor sells a variety of stitching tools—including software for making spherical videos. If you watch any of the videos, you will notice the "seams" from time to time. Static images are much easier to stitch. So the Mars rover selfie is not all that amazing. In scientific imaging one must always be cautious of manipulated images (panoramic stitching, etc.). The rover selfie is a PR shot, so that's okay. The selfie was taken with the camera mounted on an extended robot arm. Surprise: A Selfie Curiosity! With cameras that do not look directly towards the camera Mahli, reach the end of the robot arm that permits the acquisition of the always spectacular picture. Note the considerable dust on the rover deck. The writer seems to see the light source coming from the right and the prominent features to be ridges. Looks to me like the light source is to the left of the image and the prominent features are grooves -- lot less mysterious that way. A weird circular landform recently spotted on the surface of Mars might look like a deformed waffle--or maybe the surface of a human brain. But as to what the strange feature really is--and how it got there--scientists at this point have only opinions. mars moundAn image of the enigmatic landform on Mars taken by HiRISE, one of six instruments on NASA's Mars Reconnaissance Orbiter. The image was released by NASA on Wednesday, Dec. 3. 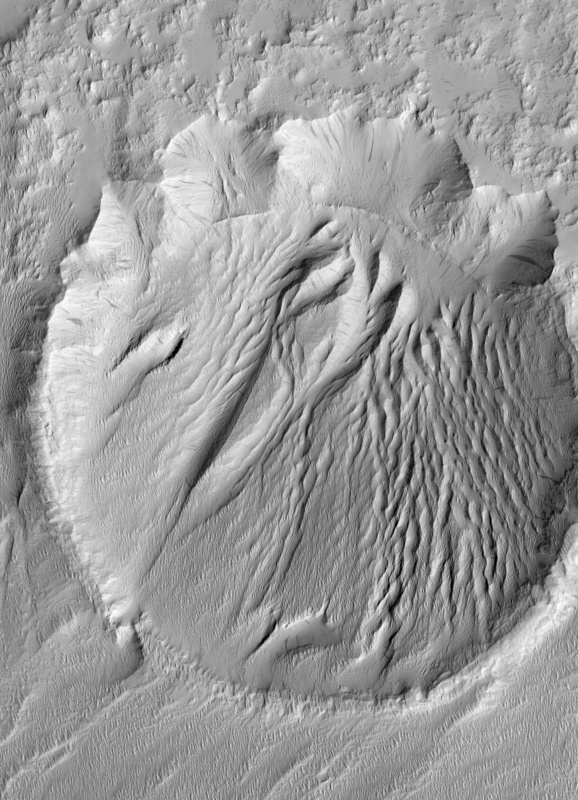 The 1.2-mile-wide mound, which was observed by NASA's Mars Reconnaissance Orbiter Spacecraft, is located in the planet's Athabasca region--an area known for lava flows. "It is highly possible that volcanism played a role in creating this feature. Perhaps lava has intruded underneath this mound and pushed it up from beneath. It looks as if material is missing from the mound, so it is also possible that there was a significant amount of ice in the mound that was driven out by the heat of the lava. There are an array of features like this in the region that continue to puzzle scientists." The scientists hope that further observations and analysis of the image will yield a better explanation of the mound and its formation. The Mars Reconnaissance was launched in August 12, 2005 on an ongoing mission to study the red planet. The team responsible for the Sample Analysis at Mars (SAM) instrument suite on NASA's Curiosity rover has made the first definitive detection of organic molecules at Mars. Organic molecules are the building blocks of all known forms of terrestrial life, and consist of a wide variety of molecules made primarily of carbon, hydrogen, and oxygen atoms. However, organic molecules can also be made by chemical reactions that don't involve life, and there is not enough evidence to tell if the matter found by the team came from ancient Martian life or from a non-biological process. Examples of non-biological sources include chemical reactions in water at ancient Martian hot springs or delivery of organic material to Mars by interplanetary dust or fragments of asteroids and comets. While the team can't conclude that there was life at Gale crater, the discovery shows that the ancient environment offered a supply of reduced organic molecules for use as building blocks for life and an energy source for life. Curiosity's earlier analysis of this same mudstone revealed that the environment offered water and chemical elements essential for life and a different chemical energy source. I see twisted ropes in this stunning image taken with HiRISE.